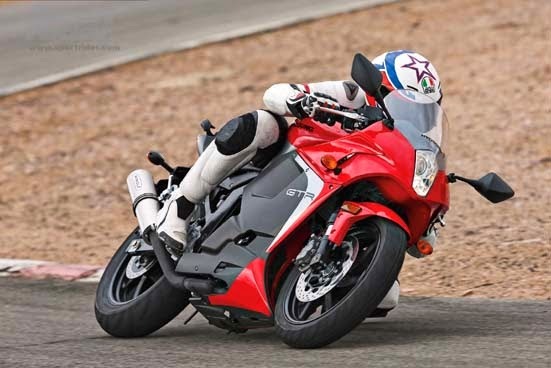 South Korean motorcycle manufacturer, Hyosung conduct refresher on one of the models of sports bike namely Hyosung GT250R. A series of changes made ​​by the manufacturer of origin the South Korea, make the GT250R appear with the sports character a stronger. Hyosung preferring not to be many plays many patterns or graphics on this new model. The combination of three colors namely white, red and black to the main treat. Front cover with windshield then fairing aerodynamic with the vent is large enough so that the engine temperature remains stable and the stern made tapering makes it look more aggressive. In contrast to previous models which use exhaust black color, this new model adopts the flue gas channel that has been coated with chromium that is more aesthetically elegant. Hyosung GT250R equipped with engine 4-stroke V-Twin oil-cooled capacity of 249 cc are juxtaposed with the five-speed manual transmission. This machine is capable of generating power 28 bhp at 10.000 rpm with a torque of 22 Nm at 8000 rpm.